Hair transplant surgery has been around for decades, but in recent years, the technology has become so advanced, and surgeon skill so precise, that hair loss can almost be completely restored in some areas. The process of hair transplants does not create new hair. Instead, healthy hair follicles are removed and extracted from the back of the head where hair growth is considered permanent, and the grafts are then transplanted to a more visible area on the front of the head. Dr. Clinton Webster offers FUE (Follicuar Unit Extraction) using the highly technical ARTAS hair transplant system to complete this process. Our patients are extremely pleased with their outcomes and consider their results to be full and natural. "Dr Webster and his staff were fantastic and very professional. I was having the laser hair treatment which was fairly new but the staff was exceedingly knowledgeable and the process was painless. I have gotten many compliments on the results of the hair restoration and all have been extremely positive!" "The robot hair restoration procedure was quick and painless! Dr Webster and his wonderful staff made the day easy and pleasant. I would recommend this procedure to anyone looking for that extra boost of confidence!" "41 Year Old Male - Great guy very comfortable procedure." "I work with many plastic surgeons in the metro. Dr. Webster's clinical expertise is hands down the best I've seen. His office staff is excellent! You will be treated with the respect you deserve. I highly recommend Dr. Webster for all of your plastic surgery needs. I had a 5 star experience from door to door." Hair loss, while common, can be distressing. When nonsurgical treatment such as oral and topical medications are not enough to slow, stop, or restore hair loss, there are other effective solutions worth considering. Follicular Unit Extraction (FUE) is a minimally invasive hair restoration transplant surgery that uses robotic technology to track and extract hair follicles with precise accuracy and control. The process involves using a small (0.8mm - 1.0mm), rounded instrument or “punch” to remove the hair grafts. The FUE procedure is often preferred over the strip method (FUT) because it does not involve the use of a scalpel or stitches, nor does it leave any noticeable scarring. 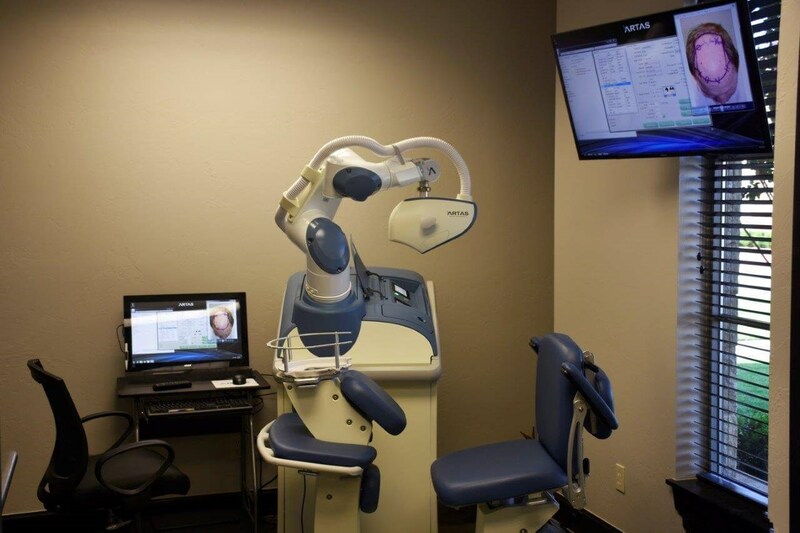 Dr. Webster offers the state-of-the-art ARTAS robotic hair transplant system for FUE, a technology that creates outstanding outcomes that last a lifetime. Dr. Webster performs FUE on-site at his accredited surgical facility. It is here where he maintains the ARTAS equipment. The entire procedure can take up to 6-8 hours to complete and the patient is usually awake the entire time. The first part of the surgery involves the extraction of the hair follicles from the back of the head, and the second part involves the actual transplant. Recovery is dependent upon each individual and the extent of their surgery--meaning how many grafts were used to accomplish the desired result. Exercise and strenuous activity should be avoided for 1-2 weeks. Within the first few weeks after this procedure, the newly transplanted hair grafts will fall out. This is common and is to be expected. The hair follicles that were transplanted are permanent in the scalp and over time, new, healthy hair will begin to grow. It typically takes about a full year for the final results to be shown.